Eastgate Physiotherapy Sherwood Park has been providing Alberta clients with physiotherapy, acupuncture, massage therapy, custom orthotics and IMS services for more than 30 years. Our slogan, “Experience, Expertise, Excellence: Your Pain Stops Here, naturally” sums up our approach to treatment. For two consecutive years, Eastgate Physiotherapy has been rated as among the top three best physiotherapists in Sherwood Park. We are highly skilled, dedicated, caring professionals who understand that we must first take the time to conduct a thorough assessment and listen to our patient’s concerns so that we can better devise a program of effective physiotherapy for them. Physiotherapist owned and operated, we are leaders in the field of physiotherapy and rehabilitation. Our multi-disciplinary team brings a wide range of effective services to you. We are experienced and effective in treating sports injuries, injuries sustained at work, motor vehicle collision injuries, and back and neck injuries and dysfunction. We also provide treatment for headaches, dizziness (vertigo), and Temporo-mandibular joint (TMJ) disorders, chronic pain and foot problems as well as treating the impact of other conditions and illnesses. We are authorized providers of physiotherapy for WCB (Worker’s Compensation Board), AHS (Alberta Health Services) and motor vehicle collision injuries. For your convenience, we can direct bill to most of the insurance companies saving you hassle and allows you to focus on your recovery. We provide service in English, Hindi, Punjabi, Gujarati, Marathi, and Urdu. Our spacious 3,000 square foot, state-of-the-art rehabilitation facility has ample free parking for your convenience. We are located right by the Sherwood Park transit center. For patients arriving by car, we have easy access from the Sherwood Park Freeway (Wye Road), Anthony Henday Drive, and Highway 16 and Highway 14(through Anthony Henday Drive). Satish Pandya, B.Sc., PT, MCPA, CG IMS, CMAc. Satish Pandya, president of Eastgate Physiotherapy Sherwood Park, believes that a thorough assessment of each patient is the key to his successful professional practice. A lifelong learner, Satish brings continual upgrading and skill addition to his profession along with more than 30 years of experience as a physiotherapist. He received his Bachelor of Science in Physiotherapy from the University of Bombay and that began a life-long quest for additional learning. He followed his degree immediately with a post-graduation certification in medical rehabilitation for physiotherapists from All Indian Institute of Physical Medicine and Rehabilitation in Bombay. In 1982, he passed the Canadian Physiotherapy Association examination and became a full-time active member. He received his Certificate in Medical Acupuncture from the University of Alberta under Dr. Steven Aung. He completed the Certificate Program in Gunn Intra Muscular Stimulation (IMS) from the Institute of Study and Treatment of Pain in 2003. He trained under Professor Mariono Rocabado to study the diagnosis and treatment of temporomandibular joint disorders (TMJ) and cranial dysfunction. He completed his advanced manual therapy credentials and has been on the manual therapy roster of the College of Physical Therapists of Alberta. He completed McKenzie and Cyriax courses in manual therapy. Among dozens of other courses he completed, he took Complications of Total Hip and Knee Arthroplasty), Sports Medicine 101, and PTHER 570 Radiology for Physiotherapists, all from the University of Alberta. He completed courses in Quantum Laser, Vestibular Rehabilitation, Emergency Care, Referral Source Management, The New Patient, Hiring and Team Building, McKenzie Part A, Ad, Back Injury Prevention and Treatment, Advanced Taping and Strapping Course, Biomechanical Problems with Foot, Ankle and Lower Extremities, Active Functional Capacity Testing and Program Workshop, and many others. He received his Certificate in Functional Capacity Testing from Mathieson and Associates, Chicago. He is a long-time member of the Canadian Physiotherapy Association (orthopedic division, acupuncture division and sports division.) He is a member of the College of Physiotherapists of Alberta and a member of the Vestibular Disorders Association (VEDA). He is also a member of the Institute of Study and Treatment of Pain (iSTOP). His focus on excellence has brought accolades to his company and on two consecutive years it has been rated as among the top three best physiotherapists in Sherwood Park. This award acknowledges consistently high quality in the field of businesses and follows a 50-point inspection rating which includes everything from checking the candidate’s reputation, history, complaints, ratings, satisfaction, trust and cost toward general excellence. In 2016, Satish was also singled out for the honor and distinction of receiving the “Pride of Strathcona County” award for professional achievement. This award recognizes people who have distinguished themselves and contributed to the community with their leadership, care and compassion and overall excellence in their field. “It’s people who make our community a great place to be and through these awards, we share our pride and admiration for those who make a positive difference and for outstanding achievements that bring recognition to Strathcona County,” Mayor Roxanne Carr said in bestowing the award. 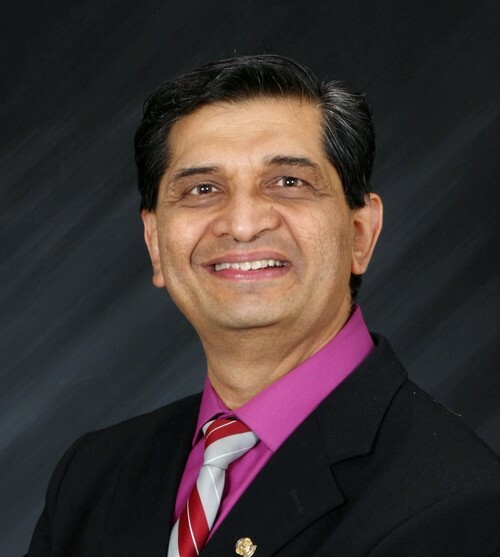 Satish opened Eastgate Physical Therapy in 1985 having previously gained experience working in orthopedic and neurology rehabilitation, outpatient physiotherapy, acute care, geriatrics, extended care and palliative care. His reputation is well known for the excellence of his work as well as for his contributions to health care information in his area including serving as a columnist in Healthy Lifestyles in the Sherwood Park News, and writing articles and health and fitness promotion in the Edmonton Journal and other publications. Active in Toastmasters, he achieved the Distinguished Toastmaster (DTM) designation in 2010. It is the highest communication and leadership recognition offered by Toastmasters International. He was awarded the Cec Pepper Memorial Award and was selected as the “Area Governor of the Year” for the District 42 (Alberta and Saskatchewan) of Toastmasters International 2008-2009. Satish is also distinguished for the volunteer work he does within his community. Among the organizations he has contributed to as a volunteer are the Arthritis Society of Alberta (for 10 years), the Hindu Society of Alberta, the Alberta Guajarati Association, honorary principal for the Alberta Gujarati School, and leader of the Arthritis Self-Management Program for five years, leader of the Fibromyalgia Self-Management Program for Three years. He has also provided his physiotherapy clinic as a work experience station for Elk Island public schools, University of Alberta, Macami College of Massage Therapy and Career College. He has been Master of Ceremonies at the Festival of Trees in Sherwood Park for five years.